Thus begins a lyrical journey through the days and weeks, the months, and the changing seasons in the life of one New Englander and his family. 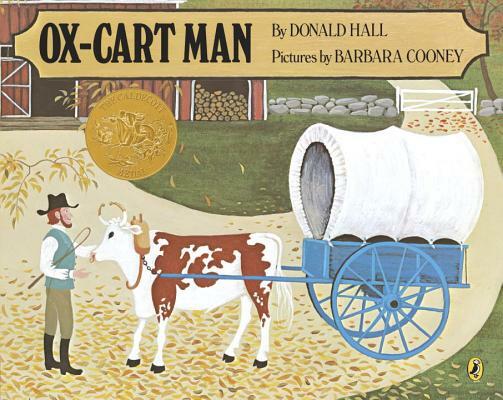 The oxcart man packs his goods - the wool from his sheep, the shawl his wife made, the mittens his daughter knitted, and the linen they wove. He packs the birch brooms his son carved, and even a bag of goose feathers from the barnyard geese. He travels over hills, through valleys, by streams, past farms and villages. At Portsmouth Market he sells his goods, one by one - even his beloved ox. Then, with his pockets full of coins, he wanders through the market, buying provisions for his family, and returns to his home. And the cycle begins again. Donald Hall is an American poet, writer, editor and literary critic. He is the author of over 50 books across several genres from children's literature, biography, memoir, essays, and including 22 volumes of verse. Hall was named the fourteenth U.S. Poet Laureate in 2006 and served for one year. He is the winner of the Caldecott Medal, the Los Angeles Times Book Prize, and has twice been nominated for the National Book Award.